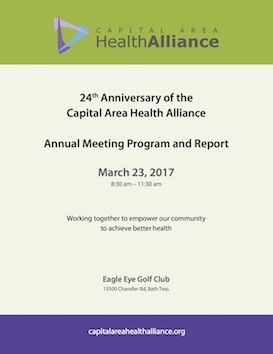 On March 23, 2017, the Capital Area Health Alliance celebrated its 24th anniversary and commitment to enhancing the health of the Tri-County community. The Annual Meeting is the high point of our year and draws attention to the many dedicated people and organizations who give their time and resources to make CAHA’s work successful, highlights opportunities for collaboration, and looks to future strategies, initiatives, and needs. Over 135 health care professionals and community leaders representing organizations throughout the Capital Area gathered to celebrate the work of the Alliance and its partners. The event started with a Committee Showcase, displaying the goals and activities of the Alliance’s committees. CAHA is powered by the many organizations and individuals who devote their energy to actively engage in committee strategies. The five committees of the Alliance are the: Capital Area Community Nursing Network, Capital Area Physicians Experience, Healthcare Workforce Committee, Healthy Lifestyles Committee, and Mental Health Partnership Council. Featured guest presenter Marcella Wilson spoke on her model, Transition to Success™ (TTS). TTS™ is a standard of care to treat the condition of poverty as an environmentally based medical condition. Recognized as a Clinton Global Initiative, TTS™ addresses social determinants of health by bringing uniform protocols and analytics across human services, healthcare, education, government, and faith based programs. To access Dr. Wilson’s PowerPoint presentation, click here. Participants were asked to discuss what steps can we take to integrate this model into our community as well as who was interested in participating in next steps of the TTS™ Model. To date, 25 organizations have indicated their interest in taking next steps. At the close of the meeting, there was a book-signing for Dr. Wilson’s newly published book, Diagnosis: Poverty, which defines a scalable, sustainable, measurable, multi-generational response to poverty. The 24th Anniversary & Annual Meeting was presented at no charge to attendees, thanks to our generous sponsors. Participate in shaping the future strategic focus and direction of the Capital Area Health Alliance. On March 16, 2016, the Capital Area Health Alliance celebrated its 23rd anniversary and commitment to enhancing the health of the Tri-County community. 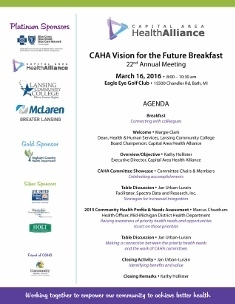 The Annual Meeting is the high point of our year and draws attention to the many dedicated people and organizations who have given their time and resources to make CAHA’s work successful, showcases the achievements of CAHA over the past year, and takes a look at what the future holds for CAHA. Over 100 health care professionals, community leaders, and volunteers from the Tri-County area gathered to celebrate the work of the Alliance and its partners as well as collaborate on connecting the community health needs of the region with the work of the CAHA committees. Entitled “Vision for the Future,” this year's Annual Meeting featured a Committee Showcase, which highlighted the work of the Alliance’s six standing committees; a presentation by Anne Barna, Planning, Promotion, and Evaluation Manager, Barry Eaton District Health Department, about the recent Community Needs Health Assessment completed by Healthy! 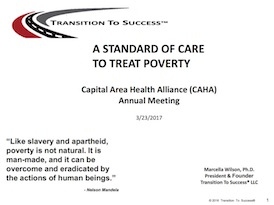 Capital Counties, the identified priority needs and next steps that can be taken; and a facilitated discussion about CAHA's role in the community and future direction. The event was held at the Eagle Eye Golf Club and was presented at no charge to attendees. How is the work being accomplished through CAHA of value to your organization?